The Vizlib Sheet Menu is a highly-customisable and easy-to-use extension for Qlik Sense that enables you to create a consistent and intuitive user experience by mirroring the design of navigation bars in web apps. The Sheet Menu allows you to group and neatly organise apps for quick and easy access and is an excellent alternative to Mashups. With Vizlib’s Sheet Menu extension, you can achieve a mashup-like style without writing a single line of code – effortlessly switch between different Qlik Sense visualisations, individual charts or whole dashboards, and expertly navigate your data in just a few clicks. Create your Vizlib Sheet Menu intuitively by dragging available sheets into groups using our user-friendly menu wizard: no coding required! 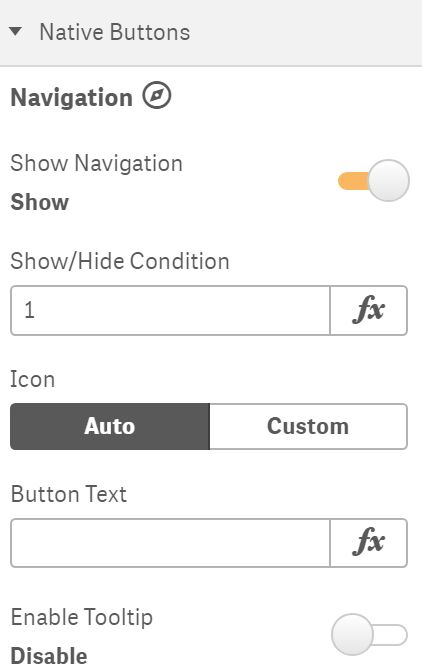 Include or exclude native Qlik Sense buttons such as edit menus, navigation, stories or bookmarks. The possibility to customise the tooltip, add links and style the Sheet Menu as you wish creates endless opportunities for personalisation and enjoyable user experience. It’s a fast, reliable and code-free solution. Open Qlik Sense and add the 'Vizlib Sheet Menu' extension to a sheet. Remove the need for mashups by creating your web app styled Qlik Sense dashboards directly from within Qlik Sense, with no coding required! 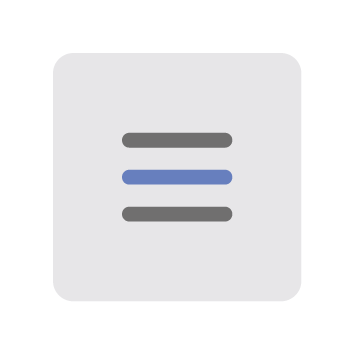 Design your top or side Navigation menu (or both!) for a more intuitive user experience. Rich customization and formatting options to achieve your own organization's branded design. 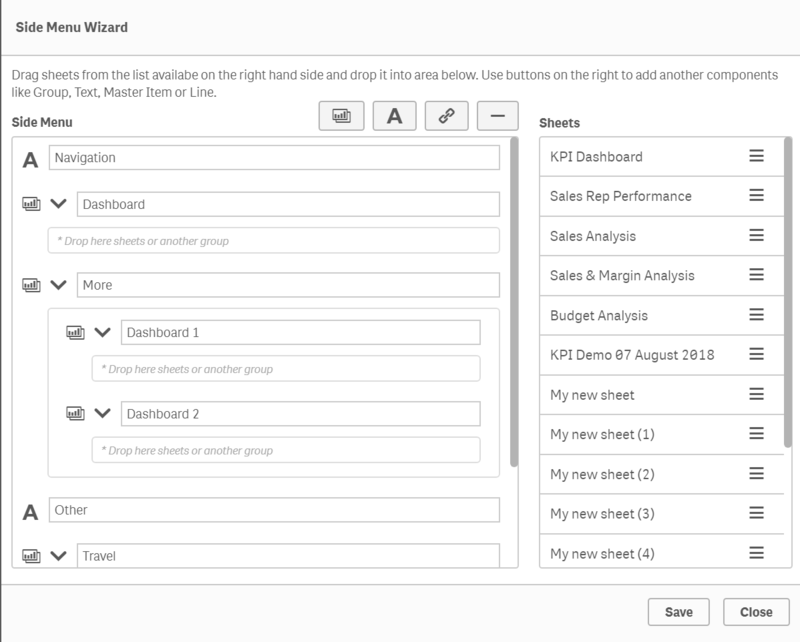 Support for (multiple) Actions to improve the user experience and user interactivity, such as making selections when navigating between sheets for a true guided analytics experience. Show/Hide not used buttons and Qlik Sense functionality such as stories, bookmarks, edit menus, navigation buttons etc..
Embed filters and calendar objects in the side menu for a more interactive user experience consistent across your whole app. 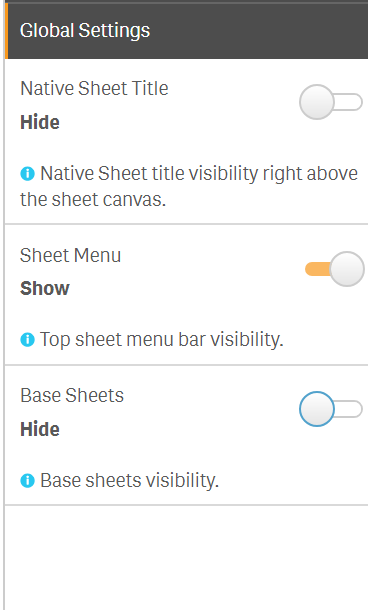 Dynamic visibility conditions of available sheets in the navigation menu depending on the user profile, variables or even Qlik expressions! Use one of our six available pre-sets which quickly sets up your standardized sheet menu layers for you to implement, adjust or modify. In the future, you will be able to generate your own custom pre-sets for your Vizlib Library. 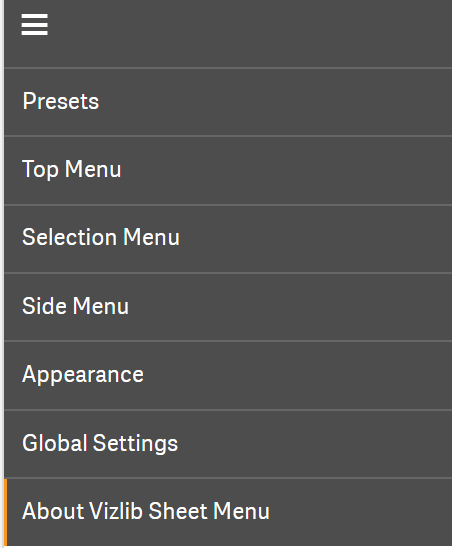 Enables (shows) or disables (hides) the custom top menu. 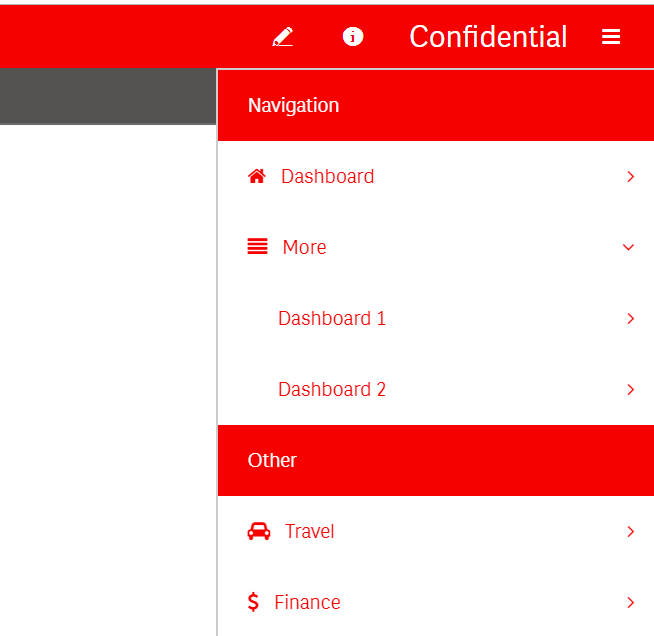 Here you can add a logo to your navigation panel, to give you app a more branded look. Further to this, you will find all settings related to adding the logo such as the URL, the size, and whether you wish to combine clicking on the Logo with Qlik actions. This section of the property panel allows you to generate the sheet menu items, such as groups or individual sheets. You can then format your sheets by customizing the name, add an icon, add a calculation condition to show/hide the sheet and combine it with actions, such as making selections before changing the sheet. It's highly recommended you use the wizard to create the sheet menu items. 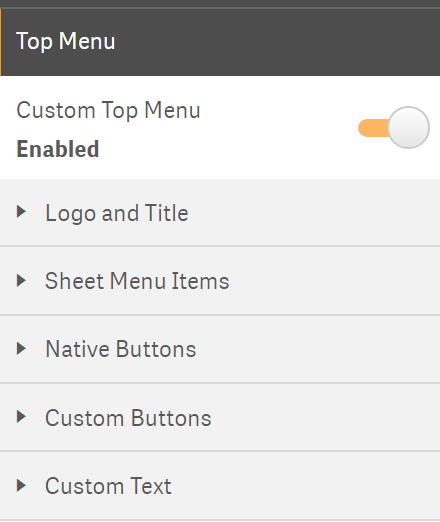 In this part of the top menu properties, you can define which native buttons (Qlik Sense functionality, e.g. Stories, Bookmarks & etc.) is included or hidden from the navigation bar. You add conditional show/hide calculations, and to overwrite it's native text description, as well as combine it with a descriptive tooltip. 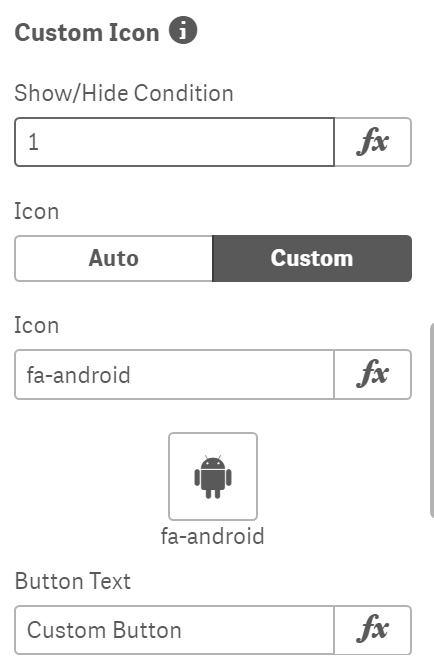 The custom button section permits you to create your own custom button which can perform user-defined actions (such as making selections, opening URLs & more) or display tooltips. The side menu lets you configure a navigation panel which pops in from the side when the user clicks on the burger menu. The side menu sections lets you configure this part by adding indivdual elements such as dividers, groupings, individual sheets and/or even selection items such as calendar and filters. It's highly recommended you use the wizard to create the sheet menu items. This section give you the opportunity to format the look and feel of your navigation panel, make it look more branded, change the style, and provide some themed consistency across your apps. 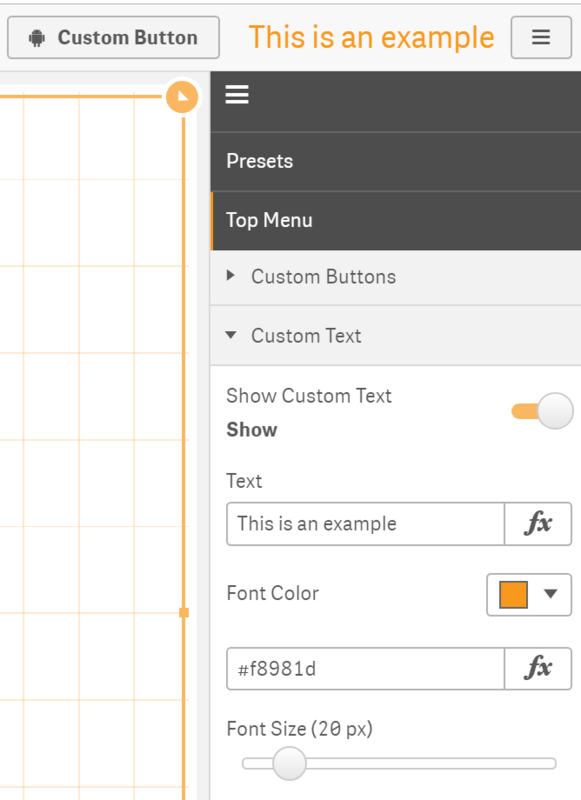 You can modify the style individual sheet items, the button and/or overall settings such as the background color, height or border visibility of the navigation bars. Global settings modify the appearance of your sheet. Here you have the ability to hide the native sheet title creating more real estate for what matters. 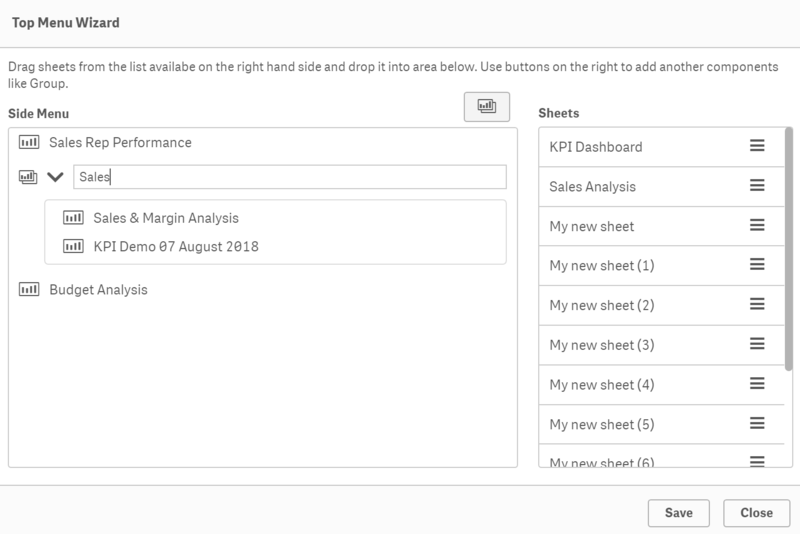 Furthermore, you will be able to also hide the top sheet menu bar visibility and hide the base sheets from the Qlik Sense Sheet Navigator for full control over which sheets are exposed to the users. The Vizlib Sheet Menu should be present on all sheets where the navigation bar is needed (at least one tile). The first load of the app is resulting in a quick flicking before the sheet menu is loaded, which can not be circumvented. 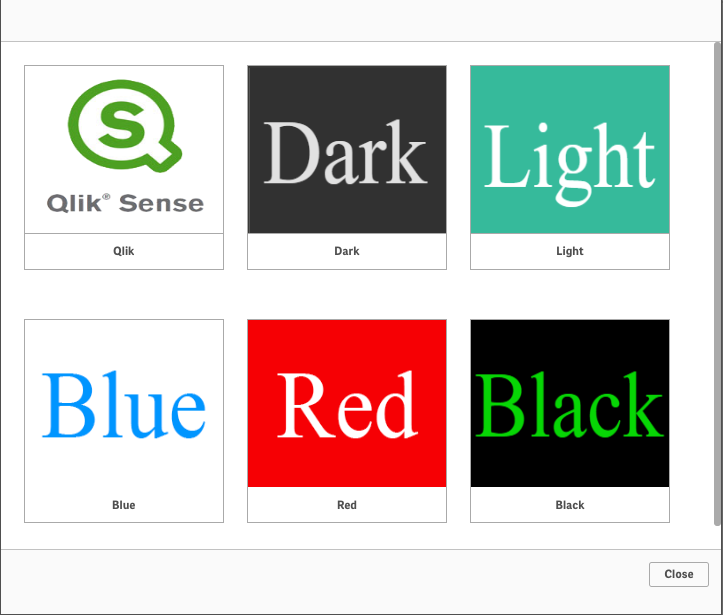 Vizlib Sheet Menu is now supported in Qlik Sense February 2019! 2018 © Vizlib Ltd. - All rights reserved.